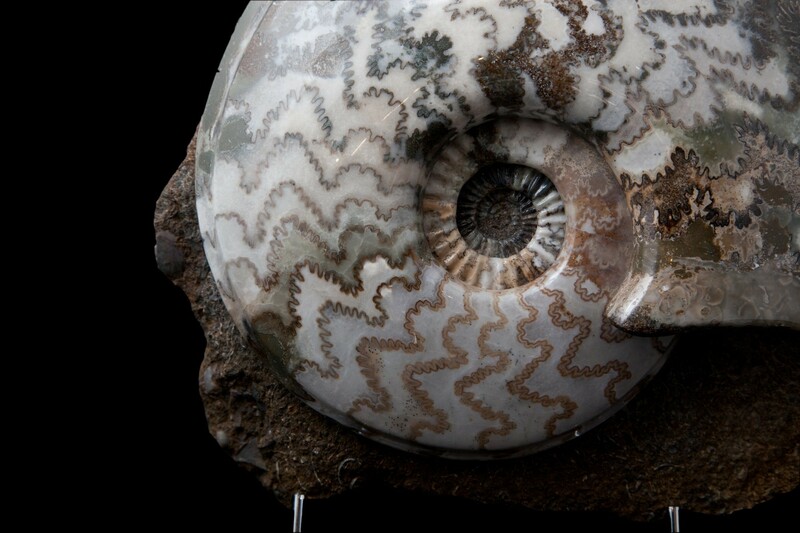 This beautiful spiral shell is that of an ammonite: an extinct marine organism from the same family as a squid. The ammonites (a type of the ammonoid subclass) existed from 200 million years ago and became extinct at the same time as the dinosaurs (66 million years ago). 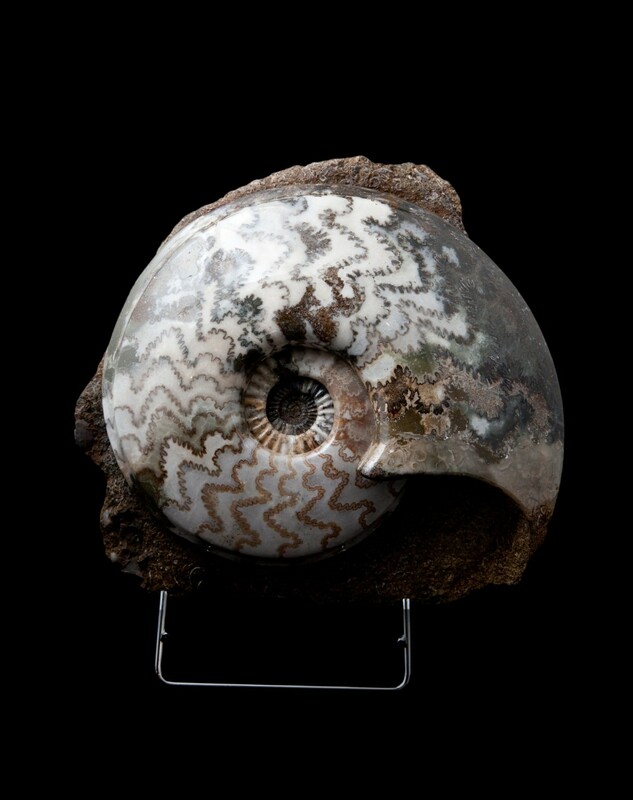 These organisms grew by adding chambers to outside ring and continuing their shell’s spiral, so that fossil ammonites this large are extremely rare. In this specimen, the shell has dissolved away revealing the exquisite, waved suture lines: the boundaries of the ammonite’s internal chambers. The relatively simple lobes of these lines indicate that this ammonite is one of the older species, from the early Jurassic (around 180 million years ago). Although the shell portrays an image of beauty, ammonites were carnivores: eating only other animals. Control of the gas/liquid content inside the ammonite’s chambers enabled it to stay in the water column, move and capture its prey by jet-propulsion. The multi-coloured appearance is due to the sediment which filled the shell as it lay on the ocean floor. Some chambers show granular sand, while others are filled with pure crystalline quartz and/or calcite. These crystals grew as a liquid, containing some dissolved sand and shells, slowly permeated through the spiral and crystallised over millions of years under pressurised conditions. The shells of some other organisms can be seen in the aperture of the ammonite (around 1cm long). These are the shells of brachiopods: small oyster-like organisms with shells similar to the sea shells we see on beaches today. 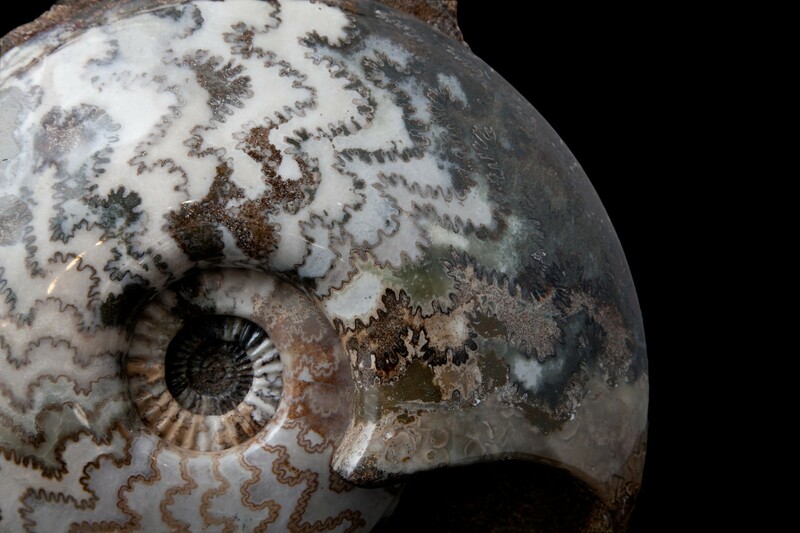 The outward simplicity of this spiral shape is overwhelmed by the complexity of the suture lines, imitating how the tranquillity of the marine environment contrasts to the ammonite’s tireless requirement to stay afloat, move fast enough to catch its prey and avoid predators.